VR technology has come into our life, more and more people high on playing 3D movies on VR headsets. Samsung Gear VR is an impressive showcase of what is possible with mobile VR, it creates a better-than-expected sense of immersion using a Note 4, Galaxy S6, Galaxy S6 Edge as its screen and engine; apps, while limited, are all free. When you get a stunning Gear VR, you probably would like to watch your own 3D movie downloads on Gear VR in virtual cinema mode. Whereas, if you often access 3D video sources with YouTube application, how to enable Gear VR to play these downloaded 3D YouTube movies without any limit? And in this page, we will introduce a simple way to enjoy downloaded 3D YouTube Videos on Gear VR. 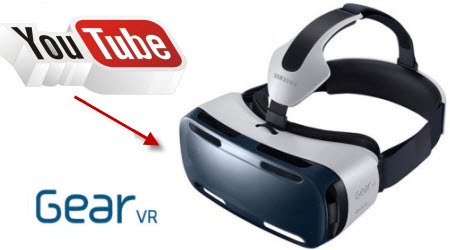 Most of 3D YouTube files are in FLV format which is not a compatible format for Samsung Gear VR. To put 3D YouTube files to Gear VR for playing without trouble, you need to convert 3D YouTube videos to Gear VR friendly 3D SBS formats first. It's easy to do with some help from a third-party YouTube 3D video converter tool. 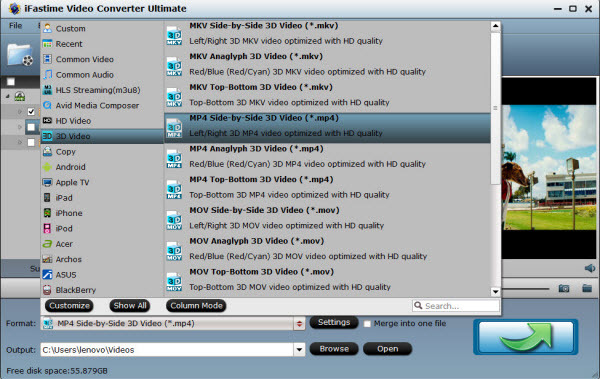 Here iFastime Video Converter Ultimate has been proven to be an excellent 3D conversion tool. With it, you can easily and quickly convert 3D YouTube videos to Gear VR compatible SBS 3D MP4/MKV effortlessly. It supports five types of 3D videos including Anaglyph(Red/Cyan), Side by Side, Side by Side (half-width), Top and Bottom, and Top and Bottom (half-height). Besides, the program enables you to convert 3D videos to 2D videos. 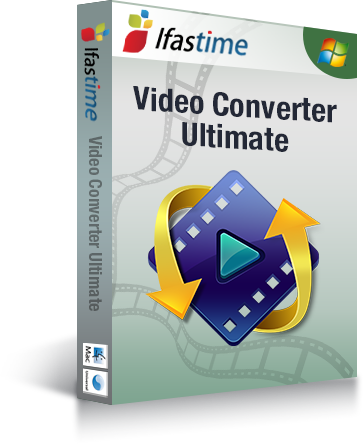 If you are using a Mac, please turn to iFastime Video Converter Ultimate for Mac. - Support multimedia players iPhone, iPad, iPod, Apple TV, etc. Click "Add video" button to add 3D YouTube FLV videos to the program. You can also directly drag the video files into the program. And you can add multiple files to save your time for this program supports batch conversion. Click "Edit" on the menu to trim, crop, adjust special effect, insert subtitles to your YouTube video, so that you get the very part and effects at your will. 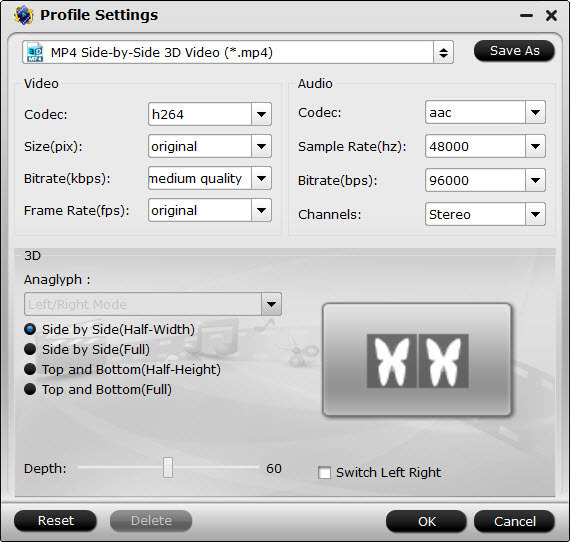 Click "Format" and select "MP4 Side-by-Side 3D Video (*.mp4)" from "3D Video" category as the output format. It works on Samsung Gear VR perfectly. Tip: You can also configure the parameters like resolution, frame rate, encoder and bit rate for video, and sample rate, channel, encoder and bit rate for audio and save it as your own profile. For common videos, 1280x720 HD resolution and 5 Mb/s video bitrate are recommended. 1920x1080 compressed side-by-side 3D should be resampled to 1920x540 resolution full side-by-side resolution. And keep audio in AAC or MP3. After all necessary settings and editing, simply press the "Start conversion" button at the bottom right corner to start the 3D YouTube to Gear VR conversion. Within a few minutes, you can get the converted video files you want by clicking the Open button. Just transfer and play videos on your Gear VR from SD Card. Note to do that you first have to place your video files into the folder named "My Videos" on your SD card. When watching a 3D video on YouTube, the settings icon (the 'gear' icon in the bottom right corner) presents a 3D On/Off Switch. Be sure it is in the "On" position, then select your preferred options. Without special hardware, you may select "Full Color" and "Red/Cyan" to display the video in anaglyph. 3D will only need a inexpensive pair of red/blue glasses. Plus, YouTube has official 3D channel; there you can find lots of 3D YouTube videos related to different niche. a.You can customize your searches a bit by using the search queries.